On the Trail of Texts Along the Silk Road. Russian Expeditions Discoveries of Manuscripts in Central Asia / The Catalogue of the Exhibition. Introductory articles by I.Popova and Takata Tokio. Entries by E.I.Kychanov, I.F.Popova, L.Yu.Tugusheva, M.I.Vorobyova-Desyatovskaya. Kyoto 2009. The Kyoto National Museum and the Institute of Oriental Manuscripts of the Russian Academy of Sciences in Saint Petersburg proudly present On the Trails of Texts Along the Silk Road: The Russian Expeditions Discovery of Manuscripts in Central Asia. The manuscripts excavated from the Western Regions of China, primarily Dunhuang, are said to number fifty thousand and belong to four major collections in the world—respectively in China, the United Kingdom, France, and Russia. About one hundred years ago, exploration parties from England, France, Germany, and Russia and the Otani expedition from Japan headed to Central Asia in search of these rare artifacts. The Russian collection belonging to the Institute of Oriental Manuscripts of the Russian Academy of Sciences has over twenty thousand works, including fragmentary segments, written in classical Chinese, Tangut, Khotanese, Tokhari, and Sogdian, and is well known for its Buddhist scriptures and rare texts from Dunhuang, Central Asia, and Khara Khoto. Featuring approximately 150 exemplary hand-copied and printed manuscripts belonging to the Institute, this special exhibition highlights documents discovered in Khotan, Kucha, Karashar, Turfan, Dunhuang, and Khara-Khoto and dated to around the first to second century A.D. to the twelfth century A.D. 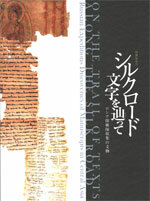 This rare opportunity to view these historic works from the eternal Silk Road in Kyoto, which has played a major role in Dunhuangology—the field created to research one of the greatest twenty-century discoveries in the Humanities—also reflects upon the fascinating differences in lettering, format, and writing style of the various manuscripts. In closing, we express our gratitude to all those who made this exhibition possible. On September 7, 2018, at the IOM RAS the Seventh St. Petersburg Tibetological Seminar will be held.